Seed and nut packed energy bars from Bon Appetite. Preheat oven to 350°. Line a 8"x8" glass dish with parchment paper, leaving a generous overhang on all sides. 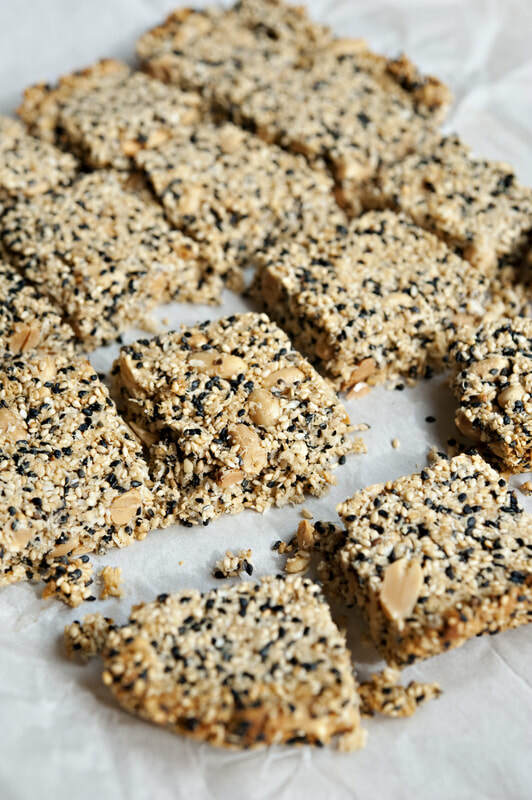 Mix sesame seeds, coconut, peanuts, and salt in a large bowl. Mix honey, peanut butter, and vanilla in a small bowl. Add to sesame seed mixture and mix well. Scrape mixture into prepared baking dish; press firmly into an even layer. Bake until golden brown around the edges, 20–25 minutes. Transfer to a wire rack and let cool until firm, 30–40 minutes. Lift out of baking dish (if it starts to crumble, let cool longer) and cut into 16 bars. Let cool completely.